Profile by Bryce Loschen: Mourning Doves are small gray-brown doves with black spots on the wings and a long, thin tail. In flight they show their long tapered tail with white tips. Mourning Doves get their name from their soft, drawn-out coos which sound like laments. Inexperienced listeners can mistake their coo-ah, coo, coo, coo song for an owl. Mourning Doves also make a loud whistling noise with their wings during take off and landing that might startle predators or warn other flock members. Mourning Doves can be found almost anywhere except in the deep woods. They prefer farms, towns, open woods, roadsides, and grasslands with a mix of trees and open spaces. 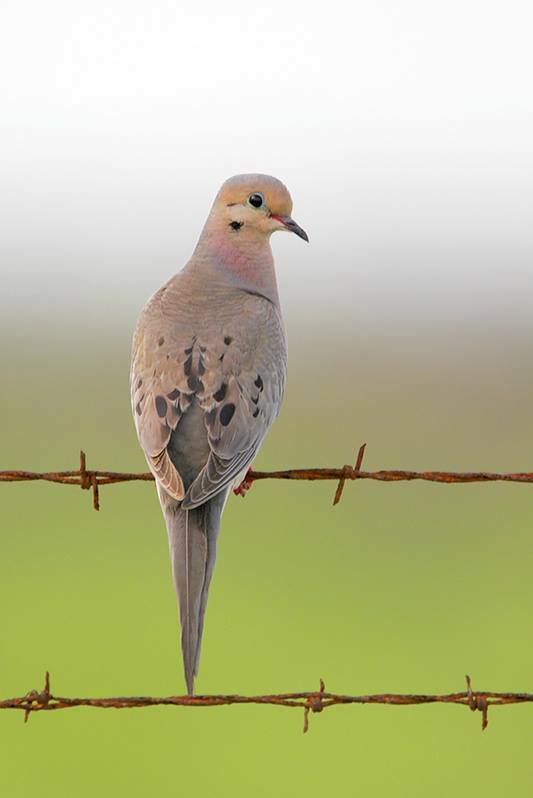 Seeds make up 99 percent of a Mourning Dove’s diet. They favor seeds of cultivated grains, grasses, ragweeds, and many other plants. Occasionally they will eat snails. Mourning Doves are ground foragers and will consume up to 20 percent of their bodyweight daily. While nesting, pairs create flimsy nests of twigs usually in trees or shrubs but sometimes on the ground or on a man-made structure. 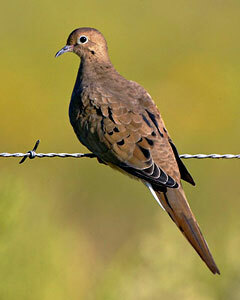 Mourning Doves are one of our most common birds and can be found all throughout the continental United States. 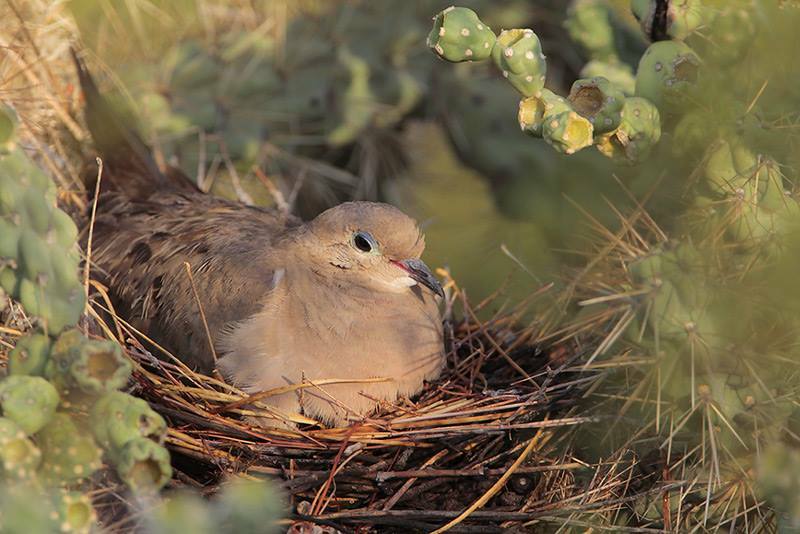 Mourning Doves are well suited to human altered habitats and thus population numbers likely increased with increasing settlement of North America. However since Mourning Doves are ground foragers, they are vulnerable to lead poisoning from consuming fallen lead shot in heavily hunted areas. Mourning Doves are common in Texas year round so look out for them in your backyard and while visiting the Houston Audubon Sanctuaries! In Houston Mourning Doves are very fond of suburban sites, where they may often be spotted on sidewalks and short grass looking for seeds. They visit tray-style feeders, but prefer to feed on seed scattered on the ground or on patios. Fairly dense shrubs and trees make good nesting sites. Mourning Doves often take advantage of hanging baskets as relatively safe nesting sites. Notes: Mourning Doves are declining in numbers in certain neighborhoods in Houston, where they appear to be displaced by White-winged Doves. This is particularly evident in areas inside the I610 Loop. 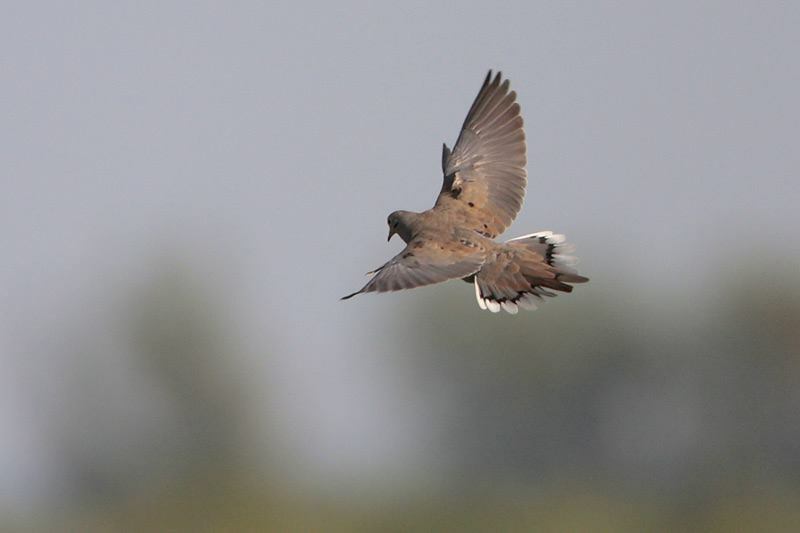 As shown in Robert McFarlane's photo, White-winged Doves are larger than Mourning Doves and even when on the ground display a white border on the wings, making them easy to distinguish. Because Mourning Doves are so tame, they are an easy species to study. The Cornell Lab of Ornithology sponsors Dove Detectives, a study-watch of urban doves and pigeons.